1 edition of Chemtrails, chemistry 131 manual, fall 1990 found in the catalog. Add another edition? 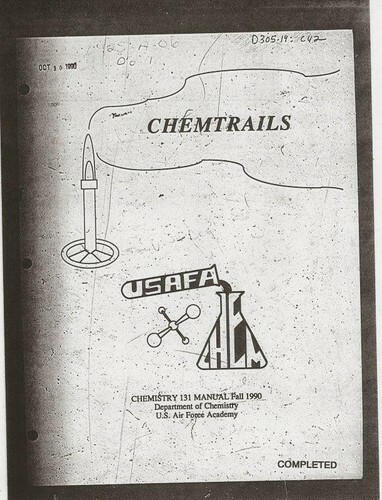 Are you sure you want to remove Chemtrails, chemistry 131 manual, fall 1990 from your list? Published 1990 by Dept. of Chemistry, U.S. Air Force Academy in [Colorado Springs, Colo.?] . Microfiche. [Washington, D.C.?] : Supt. of Docs., U.S. G.P.O.,  4 microfiches : negative. Chemistry 131 manual, fall 1990. December 2, 2011 Edited by 122.148.157.241 Edited without comment. December 2, 2011 Edited by 173.56.65.39 Edited without comment.